Steven Roberts and Alan France in The Conversation examine aspects of inequality between and within generations. There’s no doubt there are differences between the experiences and opportunities of young people compared to their parents. But when you enter the smashed avocado debate of baby boomers versus millennials, you overlook the inequality between members of the same generation. This also misses other ways inequality is perpetuated, such as through the intergenerational transfer of wealth. It’s uncomfortable for many to admit but Australia is a hugely unequal society, both in terms of incomes and wealth. Australian households in the top 20% account for half of the income stream, that’s about 12 times more than the bottom 20%. At the far ends of the distribution, the average weekly after tax income of the top 5% is 13 times that of the bottom 5%. But this isn’t just an artefact of wealth in different generations. There are multiple ways we can glean this, most notably in relation to poverty. address inequality, sexism and violence against women in all its forms. The Royal Commission into Family Violence found that gender inequality is one of the key drivers behind family violence … The Victorian Government recognises that gender inequality is even more of a problem when it intersects with other forms of inequality and disadvantage, such as Aboriginality, disability, ethnicity, sexual orientation, gender identity, rurality and socio-economic status. Journalist and gender equality pioneer, Anne Summers, commented on the Victorian report. Norman Hermant on the ABC discusses a new report about the importance of young people picking up transferable skills rather than expecting jobs for life. Peter Martin in Fairfax on differential economic indicators across the country and George Megalogenis in The Monthly a couple of days later on the same subject. The Chifley Research Centre’s Michael Cooney points out in Guardian Australia that one of the global Sustainable Development Goals is as follows: ‘By 2030, progressively achieve and sustain income growth of the bottom 40% of the population at a rate higher than the national average’. We have noted the Centre’s work previously. One of many articles on the significance of the Trump win, this one by journalist Mike Steketee in Inside Story looks at the implications for how Australian governments deal with growing inequality here. Also this by Lenore Taylor in Guardian Australia. Katharine Murphy in Guardian Australia analyses and pollster Peter Lewis comments on a recent poll about Australian public attitudes to inequality. While 65 per cent of those polled agree ‘Australian society has become more unequal over the last few years’ there is resistance to radical counter-measures like an inheritance tax or taxing assets just like income. On the other hand, 63 per cent believe the minimum wage should be increased significantly. The ABC reports that a new study from the Social Policy Research Centre claims that the proportion of Australians living in poverty has hardly changed since the turn of the 21st century, despite many years of economic growth. Melissa Wheeler and Victor Sojo (in The Conversation) argue there is a connection between gender inequality and the low number of women in leadership roles. Yet another report on inequality in the land of the fair go (to go with the many others listed under this thumbnail). This one is from the Community Council for Australia and it describes Australia as less fair, less safe and more inclined to gaol people than is the case in comparable countries. The report is here and a mordant comment on it from First Dog on the Moon is here. The Honest History book, to be published in April 2o17 by NewSouth, includes a chapter by Carmen Lawrence entitled ‘”Fair go” nation? Egalitarian myth and reality in Australia’. This week also, the eminent French economist, Thomas Piketty, visited Australia to give lectures and make media appearances. In The Conversation, political economist, Frank Stilwell, comments on Piketty’s work, particularly on the need to focus on wealth inequality. Stilwell refers to his own recent report for the Evatt Foundation on wealth inequality in Australia. (See also below 9 August.) Jane Goodall in Inside Story reviews a Piketty lecture. Dallas Rogers talks to Alanna Kamp (15 minutes) on The Conversation about Kemp’s research on how Chinese-Australian women have tended to be written out of our history. Jon Piccini writes in the latest Labour History about how Indigenous Australians were welcomed in the Soviet Bloc and how they were treated with equality. Both articles in their own way show the complexity of the influences on inequality in White settler-dominated Australia and how outcomes can change in a different environment. Ben Eltham in Overland looks at how the political class is out of touch with the mass of people. What can be done to restore some semblance of connection between rulers and the ruled? The laundry list of possible solutions is long, but not particularly promising. Some have suggested mandatory median wages for politicians, which in Australia would cap parliamentarians’ salaries at something like $55,000 annually. While this would certainly get the attention of backbenchers, it’s difficult to see how it would address the underlying causes of income inequality, or the yawning gap between the upper crust of the business class and nearly everyone else. Lynsey Hanley in the UK edition of the Guardian explains why class won’t go away. How far does what she writes apply to Australia? On the [Brexit vote] day, huge swaths of the country voted by class and geography. This was hardly surprising, considering how tensions between the classes have been exploited mercilessly by politicians. Social and economic inequalities, particularly between the south-east and the rest of the country, and between major cities and outlying towns, have grown, and that growth been tolerated, for decades – to a point where it now threatens social and political stability. Julie Walker in The Conversation looks at the massive remuneration of some Australian CEOs and the difference between CEO remuneration and workers’ wages. The Commonwealth Bank has the highest CEO pay ratio in our sample, with CEO Ian Narev earning more than 100 times the salary of an average worker. Even the lowest paid CEO in our sample earned 15 times the average Australian annual salary … The CEO pay ratio is an important measure of income inequality over time and Australian regulators should consider making this information mandatory … Historically, executive pay has not always been at the current controversial levels but has steadily increased since the mid-1970s, an increase which has continued after the global financial crisis. As education ministers meet about Gonski, Chris Bonnor and Bernie Shepherd in Inside Story look at the inequality that exists in schooling. John Falzon of St Vincent de Paul responds in Guardian Australia to proposals by Minister Christian Porter to tackle ‘welfare dependency’. ‘Australia does not have a welfare problem’, says Falzon. ‘We have a poverty problem and an inequality problem, but you know that these problems are going to be ignored when the dominant discourse focuses our attention on the “welfare problem.”’ Greg Jericho comments. Peter Whiteford comments. Peter Whiteford and Daniel Nethery write in The Conversation about the Budget’s impact. There are always alternative ways of reining in the deficit, of course. Assuming that this is the right time for tackling the budget problem, there is no reason why an alternative package, broadly distributionally neutral in its impact, couldn’t be designed … [to] identify how to balance competing concerns for fairness with measures to reduce the budget deficit. The article includes a comparison of OECD countries’ expenditure on social benefits for low income households. It shows that ‘the Australian social security system is more targeted towards the poor than any other rich country’. This presumably goes some way to balancing other influences leading towards inequality in modern Australia. To mark the Boyer Lectures by visiting expert, Sir Michael Marmot, (president of the World Medical Association) on ‘Fair Australia: Social Justice and the Health Gap’, The Conversation has a couple of articles, from Sharon Friel from ANU on how class and wealth affect our health and Fran Baum from Flinders on policy responses, with links to related earlier material. A collection from recent online sources citing various studies of inequality in Australia and overseas. They look at globalisation, the impact of inequality on the economy, and health, housing and digital access aspects of inequality. Greg Jericho (see below 4 August) follows up in Guardian Australia with historical data (mostly since 1998) on sluggish wage growth. He notes that the Commonwealth Bank CEO, on $12.3 million annually, is an exception. Jericho broadens the focus to why we need to shake up economic policy. Lots of history on inflation and GDP growth. More from Jericho on 6 September on disconnect between GDP growth and how ordinary people are doing. Distinguished authors in The Conversation on work from the Evatt Foundation on growing wealth inequality in Australia since the 1970s, on the policy implications, and on what this says about our egalitarian myths. Greg Jericho in Guardian Australia crunches numbers for recent years on cost of living, mortgage interest, and real wages and concludes that, ‘despite wages growing at record lows, for those households who have benefited from lower mortgage payments, cost of living pressures are now as low as they have ever been’. Jericho follows up on issues raised by and comments on his original piece. Jericho takes a historical look at unemployment. Christian Marx in Australian Independent Media Network in October on unemployment. The Melbourne Institute survey on Housing, Income and Labour Dynamics in Australia (HILDA) has been going for 15 years and here is its latest report. Plus a bundle of articles riffing off it. Victoria Fielding in New Matilda about how the election campaign failed to grasp the importance the community attaches to growing inequality (11 July 2016). Related from Anne Coombs on the role of governments. Jessica Irvine in Fairfax continues with a series of articles (search on Google) on inequality – this time on ‘intergenerational earnings elasticity’ – and Philip Adams talks to Elizabeth Farrelly and Christos Tsiolkas on whether we are creating an unequal Australia. People in lower socio-economic brackets much more likely to die of heart disease. Leigh’s John Freebairn lecture, ‘Markets, monopolies and moguls’, delivered in Melbourne on 19 May. Greg Jericho in Guardian Australia takes a historical view and makes some suggestions about likely futures. This detailed report was based on a survey of 1600 Salvation Army clients. Denis Bright in the Australian Independent Media Network looks at some ‘no-go areas’ in Australian politics to do with inequality and the reliance on ‘trickle down economics’. Bridie Jabour in Guardian Australia looks at difficulties faced by Generation Y in getting access to housing and what this says about deeper issues of inequality. Returning to the fray well into the first quarter, we link to a Guardian interactive that compares Generation Y now to the same cohort up to 30 years ago, to other cohorts, and to other countries plus a short piece from Max Chalmers in New Matilda which includes a fascinating graph, reproduced below, showing the gender pay gap returning to the high levels of the 1980s. There are links to an ACTU report for International Womens’ Day. But why did a bloke write the story? Perhaps implies that male attitudes are part of the problem. 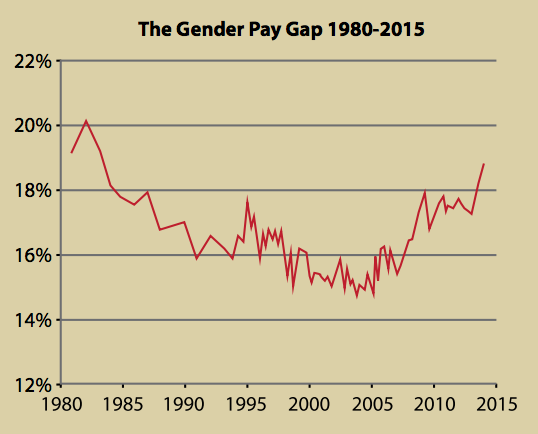 Certainly shows that gender is and has always been a key driver of inequality. Elsewhere, Eva Cox reckons the feminist project needs a reboot. The article drew 177 comments.